I have a strange relationship with this book. Back in 2008 I was having a talk with my then-agent about what to write next. He said to me ‘You ought to write something like The Black Swan,’ proving, as we shall see, that he hadn’t read the book. I duly bought a copy, had a quick flick through it, decided it was pretentious tosh and put it to one side. So it has sat there unread for four years, until I was needing a bit of light relief from physics books and decided it was time it was reviewed. I quickly discovered this is in many ways a very readable book, though with some serious reservations I’ll mention in a moment. Nassim Nicholas Taleb really only makes one point in the entire 292 pages, but it is a very important point: that there are two types of randomness, and the sort physicists and economists deal with bears very little relationship to the kind of randomness that drives everything from the weather to sales of books and the success or failure of traders. This is a hugely significant point, and Taleb has no end of fun pointing out the idiocy of those who try to use predictions based on the normal distribution bell curve in situations that are dominated by huge unexpected discrepancies. As he points out, a turkey trying to predict the future given its normal distribution of life’s ups and downs in the past would never predict the day when Christmas looms on the horizon and it gets the chop. So far, so good. And Taleb uses some great examples and makes some excellent points along the way. (Or rather scores some excellent points as this is very much a ‘me versus the world’ book.) But, despite this flash of genius there are good reasons for this book only getting three stars. One is the style. It is often pompous, didactic, nit-picking and irritating. There is far too much of the author in it – I really don’t care about him or want to know about him. The other is the lack of content. My agent was wrong about ‘writing another Black Swan‘ because the whole point of mega-successful books is you can’t predict their coming. And Black Swan also proves him wrong as one of his tests of a successful non-fiction book was to say ‘Is it a book or is it an article?’ I.e. does it have enough material to make a book? 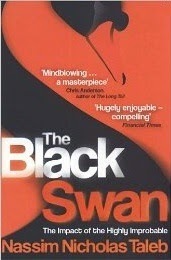 Black Swan is definitely an article posing as a book – it makes the one point over and over and over again, because there is really very little else to say. There is no real defence against this kind of randomness (though he gives a couple of pages of vague suggestions) and so it is just a warning of things going wrong, repeated indefinitely. As such it shouldn’t have worked as a book – but it did (sorry, agent). I find it difficult to recommend it because I disliked so much of it, but I have to admire that key would-make-a-great-article point, so in the end it’s a book I would probably go out and buy anyway.